"If the 230-year American democratic experiment unravels - no longer an unthinkable possibility ... "
This is how Washington Post columnist Dana Milbank begins a column published on February 2, 2017 in The (San Jose) Mercury News. An online version of the column bears this title: "The GOP senators who spoke up against Trump’s ban are all talk." Milbank's point is that the majority Republicans in the Congress "could have put the brakes on President Trump ... They didn't." In other words, our elected representatives fundamentally failed to exercise the powers granted to them by the voters, and thus made it more likely that we are, indeed, witnessing the dissolution of the "American democratic experiment." If our democracy does unravel, Milbank says, "the postmortem should focus on what happened in the Senate..." during the week following the President's so-called travel ban (i.e., nothing). 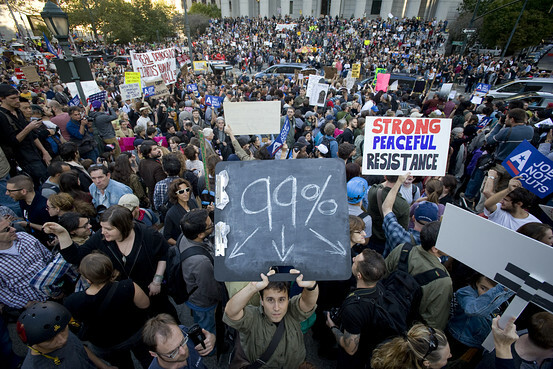 Presented above is a photo of the "Occupy Movement," a street and demonstration-based effort to compel the government to act for the "99%," not the "1%." The failure of the government to respond positively to the "Occupy" effort may well have helped President Trump and his cohorts gain control of the White House. Ironically, with Trump's election by voters who wanted more attention paid to the "99%," we may, as Milbank warns, have taken steps towards the end of democracy in the United States (not the result the voters expected, or desired, of course). That hypothetical "end of democracy in the United States" is still hypothetical, but Milbank is certainly correct that this possibility is no longer "unthinkable." In fact, we had all better start thinking about that possibility quite seriously, and thinking about what to do about it, too. If we don't do something (if we emulate the Republican majority in Congress who didn't "like" the President's Muslim ban, but did nothing to stop it), then what is now only "possible" can ripen into the "actual," while we watch and wait for somebody else, somewhere, to do something. Zeynep Tufekci tells us that demonstrations, in and of themselves, are not likely to produce actual political change. The results achieved by the "Occupy" movement certainly provide an example that confirms her observations. My belief is that voters across the country will need to "Reoccupy" our government. That means getting personally involved in electoral change. Lots of people are going to need to do that. In November 2018, there will be another opportunity to decide to whom our government will respond. The Brand New Congress movement suggests that we need to throw out those who have done nothing to respond to the demands that our government produce benefits for the "99%," instead of only for the "1%." An obvious deduction from what Milbank says is that we also need to throw out those who have done nothing to counteract ill-considered, probably unconstitutional, and authoritarian actions by the President. Whatever the mechanism, we will either "Reoccupy" our democracy, and make it work for us, or we will, as Milbank warns, watch our democratic experiment continue to come undone.